You see them, town after town in Bohol. Aside from the white sands of Panglao, the Chocolate Hills, the Hinagdanan Cave, the Mag-aso Falls, and the Loboc River Cruise, a big part of Bohol's come-on are the old churches. Most have long history that you can almost feel just by looking at them. 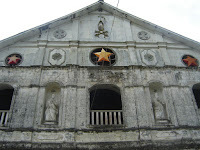 The Loboc Church, for example, has a history of music, a history which continues with the Loboc Children's Choir.